The development of highly controllable oxide thin films growth and lithography techniques makes it possible to realize genuine materials stacking and nanostructures dedicated to spintronics applications like magnetic tunnel junctions, spin filters and more recently multiferroics. A renewed interest on ferroelectric materials has emerged for the development of nonvolatile random access memories and multiferroic materials. In multiferroics several ferroic orders can coexist and be eventually coupled, as for example ferroelectric, ferroelastic and/or ferro- (or antiferro-) magnetic long-range orders. The multiferroics class of materials has commonly been extended to anti-ferroics which show antiferromagnetic and antiferroelectric behaviors. Unfortunately, single phase multiferroics with ordering temperatures above 300 K are very seldom and artificial multiferroics are actively sought after. Defining and tailoring new operational multiferroic materials has, in recent years, emerged as an important topic in modern spintronics driven by numerous potential applications and fundamental physics issues such as the coupling between ferroelectric and magnetic orders and domain structures. This opens exciting new perspectives like the control of the magnetic state of an individual device by an electric field (and/or the control of the ferroelectric state by a magnetic field). Artificial multiferroics can be realized following several routes: (i) doping a ferroelectric material with ferromagnetic ions, (ii) co-deposition and thermal treatments taking advantage of phase separation thermodynamics, (iii) the combination of ferroelectric and ferromagnetic materials in multilayered or nanostructured systems. The coupling between ferroelectricity and magnetism through interface bonding has been predicted theoretically for ferromagnetic/ferroelectric interfaces and was indeed observed in some systems. Additional magnetic exchange coupling using antiferromagnetic layer and strain coupling can be exploited as well. 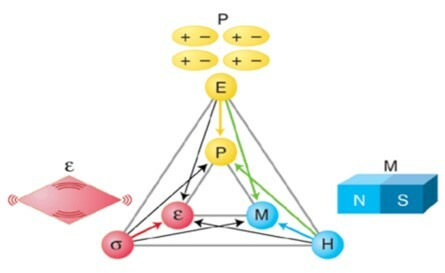 The functioning principle of multiferroics dedicated to spintronics relies on a subtle interplay between structural strain, magnetization and electric polarization (figure 1). A fundamental understanding of multiferroic materials necessarily needs to address all these properties at the same time which requires the elaboration of single crystalline multiferroic model samples and experimental techniques or tools able to address each every aspect. The laboratory has acquired expertise in growing epitaxial oxide thin films by atomic oxygen plasma assisted molecular beam epitaxy (AO-MBE). In particular of the ferroelectric perovskite barium titanate (BaTiO3) and ferrimagnetic spinel ferrites (ex. CoFe2O4) thin films, the former is an excellent and well-known ferroelectric material that displays remnant electric polarization higher than bulk crystals and the later class of materials presents a wide range of magnetic properties at room temperature. In addition to classical laboratory characterizations, the model multiferroics materials are studied within a wide range of pertinent additional synchrotron radiation techniques allowing to access the structure (X-ray diffraction and absorption), the element specific or average magnetic properties (magnetic dichroism, spectromicroscopy) and electrical and magnetic domain structure (spectromicroscopy) that allows determining the electronic and crystalline structures as well as the ferroic orders. S. Matzen, J.-B.Moussy, R. Mattana, F. Petroff, C. Gatel, B. Warot-Fonrose, J.C. Cezar, A. Barbier, M.-A. Arrio and Ph. Sainctavit,"Restoration of bulk magnetic properties by strain engineering in epitaxial CoFe2O4(001) ultrathin films", Appl. Phys. Lett. 99, 052514 (2011).